The SEAS KingRO4Y is a 3-way loudspeaker kit, using a 26 cm aluminium cone subwoofer and an 18 cm midrange coaxial. The coaxial unit uses a magnesium/aluminium-alloy cone for both the midrange and dome tweeter. All are housed in a compact closed box enclosure and powered by the Hypex PSC2.400 DSP amplifier. The design goal for this kit is to get a true fullrange loudspeaker system in a compact enclosure with outstanding performance. To achieve the design goals of this kit we chose to start with a coaxial unit in order to save some baffle space and get all of the benefits of sound quality from a coaxial. Since the chosen midrange coaxial can easily play down to 150Hz, it was possible to use a high quality subwoofer with excellent low- and high-end extension to take care of the lower frequencies. C18EN002/A - The coaxial unit uses a lacquered magnesium/aluminium-alloy cone and dome, and are integrated to form a single acoustic source. A benefit of the coaxial arrangement is that the off-axis response is equal in all directions. That makes the sound imaging very stable with a large sweet spot. It uses a Neodymium magnet system for optimum air-flow, minimal back wave reflection and a healthy sensitivity. 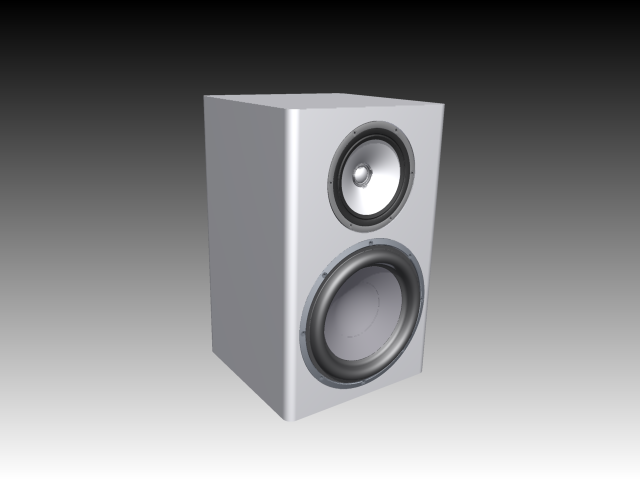 L26RO4Y - This subwoofer driver is the perfect solution for good bass in a small enclosure. With its high power handling and low Q and Fs it can handle a large amount of EQ in the low end. Since it also has a smooth response high up in frequency it can be used all the way to a midrange unit, thus eliminating the need for a dedicated mid-woofer in this loudspeaker kit. We wanted to use a plate amplifier with DSP capabilities that was easily available, and without costing a fortune. The choice landed on the PSC2.400 DSP amplifier from Hypex. It delivers 2x400 W into 4 ohm, and has a large filter bank for crossover and EQ. Since it only has 2 amplifier outputs, it was necessary to use a passive crossover on the coaxial. The coaxial is easy to filter so this was a good compromise instead of using a more expensive 3-channel amplifier and DSP. Detailed info and datasheet on the DSP-amplifier can be found on Hypex' website, http://hypex.nl. The purpose of this passive crossover is to get a proper band limiting of the midrange and tweeter, and also make sure that they have a good phase tracking, so that they are perceived as a single unit. The EQ is easier and better to do in the DSP. On the tweeter we've used a 2nd order filter and on the midrange we've used a 3rd order- and a notch-filter to make sure that the break-up is suppressed properly. 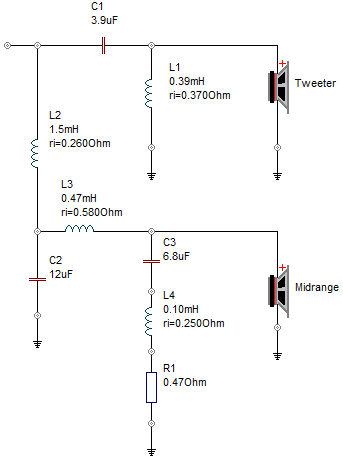 This also ensures that the two drivers are in-phase over a very wide frequency range. The crossover frequency between the midrange and tweeter is 2.1kHz. The previous figure shows the passive crossover for the coaxial. 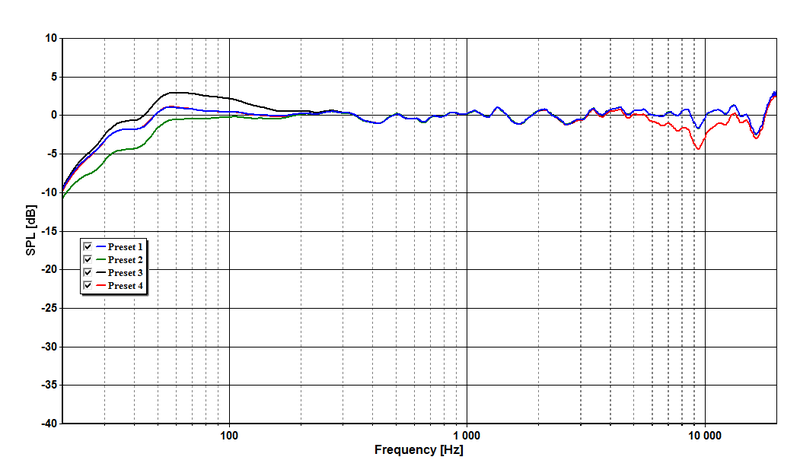 The next figure shows the response of the coaxial with the passive crossover installed but no DSP filtering. It also shows the individual driver responses and the response with inverted tweeter polarity. The EQ of the drivers and crossover between midrange and subwoofer is handled by the Hypex DSP. On the coaxial there are used 6 biquads to flatten the frequency response of the driver. The crossover to the subwoofer is made with a pole-shift and a 2nd order high-pass. Together they make the acoustic roll-off follow an LR4 at 233Hz. 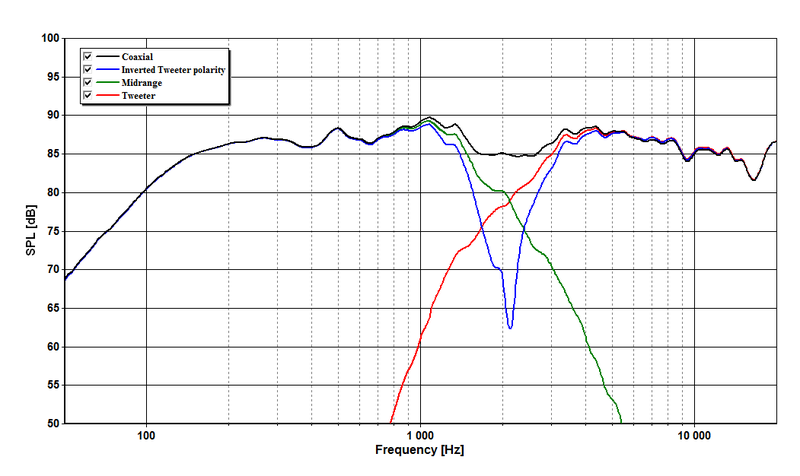 On the subwoofer we've used 3 biquads to level the frequency response. Two lowpass biquads are used to make the roll-off to the midrange follow an LR4 at 233Hz. In the low-end we've used a pole shift to move the roll-off down to 30Hz. 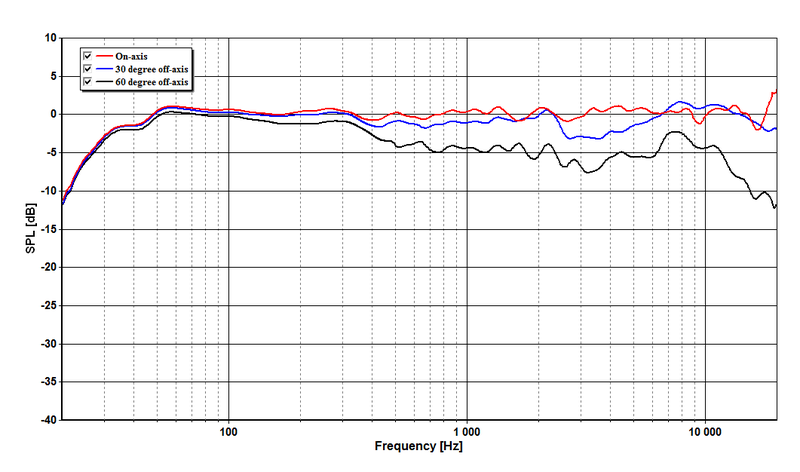 We've also added a high-pass at 17Hz for protection and also to make sure that there isn't too much gain in the DSP. One of the design goals of this system was to make the enclosure as small as possible. Since the target group is the DIY enthusiasts and not professionals, the design should not be overly complicated. The subwoofer needs a 12 L closed box as a minimum to have a nice response. However, the used enclosure is 16.7 L. This is to ensure that the needed power for the low-end EQ isn't too high. A smaller box would require more power, because the air-stiffness of the box would increase making it harder for the driver to move. The coaxial uses a closed box of 11 L, which was the smallest possible enclosure on top of the subwoofer and still be an easy build. That gives the midrange excellent working conditions and a nice response as well as good room inside the enclosure for the passive crossover. The enclosure uses 25 g of polyester foam as damping material in the subwoofer volume, and 15 g in the coax volume. The damping material is evenly distributed in the enclosure. A sound pressure frequency response measured in an anechoic chamber is shown. All of the measurements are made at 1m at tweeter height. The below figure shows the off-axis measurement at 0°, 30° and 60° using "Preset 1" in the provided DSP setup file. The next figure shows the on-axis response of the different presets provided in the DSP setup file. The measurement shows that this loudspeaker system covers the whole frequency range with an f3 of 30Hz and f10 below 20Hz. High quality stands should be used to bring the tweeter approximately to ear level or slightly above. Even in the best listening room, it is important to determine the positions where the loudspeakers will perform optimally. Placing the cabinets too close to the walls or corners will result in more powerful bass, but may also cause response irregularities in the bass/midrange area. Some experimentation is recommended in order to find cabinet positions that result in a good tonal balance and freedom from coloration. After finding a good placement of the speaker, there are almost endless possibilities to fine tune the sound balance with the Hypex DSP. The following presets are provided in the DSP setup file. 1. Normal setting; flat on-axis response. 2. Low Q woofer; slow low-end roll off. 3. Bass bump; Higher Q roll-off with a small boost. 4. Smoothed power response; Added dip around 8kHz to make the power response more even. • The positive amplifier terminals must be connected to the positive driver terminals and positive crossover input, i.e. all drivers are connected in phase. • Presets needs to be loaded one by one from the Hypex filter designer. • If tweaking with DSP, stay under 9 gain in the DSP filters to avoid digital clipping. • The Amplifier needs a +18u balanced signal level input to get the maximal gain. • For even more low end-output, the system can be made into a floor standing speaker by extending the subwoofer enclosure height with 50 and adding two SEAS SL26R passive radiators. The subwoofer DSP-filters then needs to be recalculated. • For higher max SPL the Hypex PSC2.700 can be used instead, but it needs a larger cut-out in the enclosure.